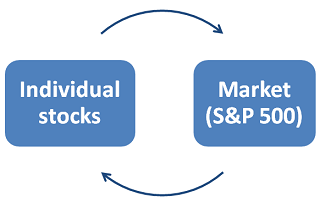 Market movement affects more than 50% individual stocks movement. So if we want to augment the possibility of making a profitable trade we have to go according to market trend (we don’t completely reject going against the market sometimes, depending on the circumstances). 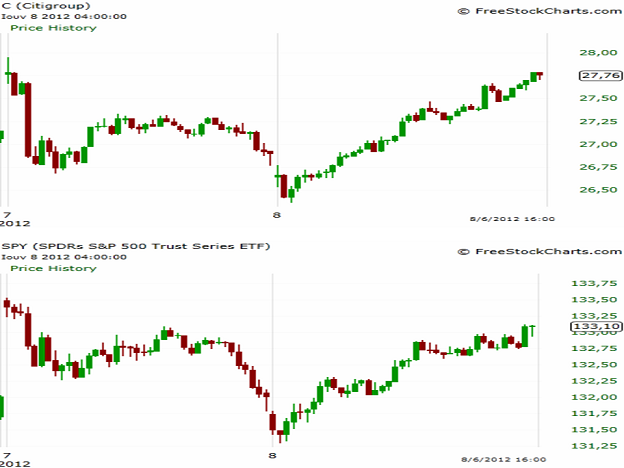 We can find market trend by using the chart of ETF SPY or S & P 500 directly. In day trading we can watch the 5 minutes chart of SPY for the intraday trend, whereas in swing we can use the daily chart of SPY. Below we present the 10 minutes and the daily chart of C, in comparison to the SPY 10 minutes and daily chart. Notice the similarity. 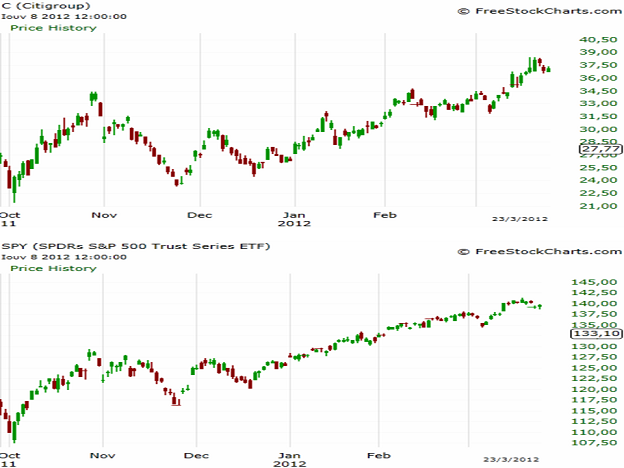 Normally stock prices should determine indices values, but the relations between them are much more complicated. High frequency trading and computerized systems, which are accounting for almost 50% of daily volume, can affect greatly the interrelations between stock prices and indices values. If for example a computerized system has a structure that tells the computer to buy 10.000 shares of BAC if market (S&P 500) is in uptrend, then the market movement will affect the stock price of BAC and not vice versa. Generally, every top-down approach (from market to individual stocks) in trading/investing, has the same results, no matter if real people or computers apply it.